Fire resistant, metal clad, “calamine” windows were historically distributed widely among buildings both splendid and utilitarian with certain design benefits. According to Guild Member Cameron Forbes, of Heather & Little, Limited in Toronto, Ontario, they enabled designers to integrate windows into trim schemes of the same material thus making them an indispensable part of the historic design today. For the renovation of the 1924 Investment Building in Washington, DC, Heather & Little furnished numerous missing elements necessary to complete the façade restoration, including seventy plus copper clad calamine windows, fixed and casement. This beaux arts limestone structure featured deeply sculpted copper cornice detail which carried on in elaborate molded window surrounds. The windows and their surrounds appear as a unified design entity. Similarly, they reproduced a 15 foot by 35 foot tall window for the 1914 Harris Theater on 42nd Street to replace an original destroyed by a misdirected demolition crew. This massive window dominated the narrow, sculpted brick façade and was an integral part of an elaborate copper trim scheme. Heather & Little worked from a dumpster full of debris and reused 70% of the original wood core as an armature. The price of custom calamine windows will deter their use in many applications but another historic Heather & Little project suggests a way to mitigate their cost. In 1991 they produced 80 double hung windows in 26 gauge zinc coated steel for a post office in Collingwood, Ontario. These were replacements for existing windows which had been originally produced without wood cores since the weight of the glass itself did not require additional support. Much of the rigidity of these windows derives from the cumulative strength of the assembled tubular sheet metal and the fixing of the glass. Coreless windows can be made energy efficient by filling the cavity with foam and by installing a thermal break in the design. By omitting the wood core, the cost of the millwork plus the labor of working the sheet metal around it is saved. Custom sheet metal windows will never be cheap, but they offer a combination of looks, durability and low maintenance that address specialized building issues. Other recent projects suggest new replacement applications for this technique beyond reproduction of historic calamine windows. 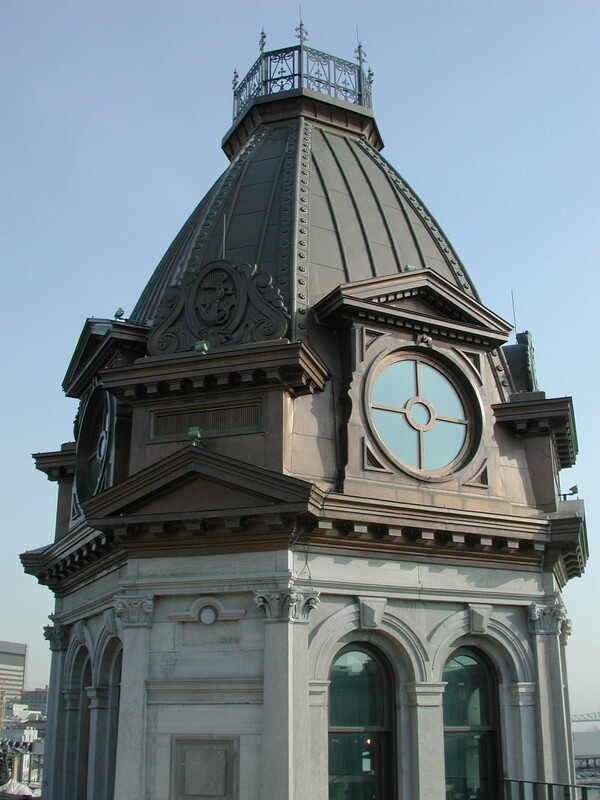 For the fire damaged cupola of the 1880 old Harbour Commission building in Montreal, Heather & Little furnished replacements in 20 ounce copper for moldings and trim. Also replaced were four round windows seven feet in diameter. Curved wood moldings of this size in exterior applications can be unstable unless fabricated from the most carefully selected grade of lumber available. While not historical, such a substitution can serve the building by reducing failures and maintenance. There are many exterior features that are no longer viable in wood in today’s environment of uncertain lumber quality and aversion to maintenance. Red copper accepts finishes as reliably as wood, if properly prepared. And, like the original “Kalamein” windows, they are fire resistant. 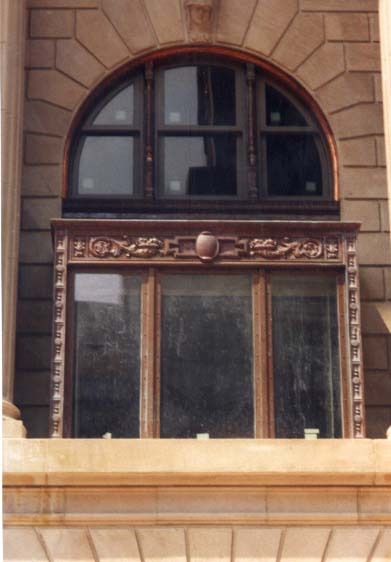 This entry was posted in Reproduction, Window Restoration and tagged Calamine Windows, Montreal, Toronto. Bookmark the permalink.